I found this you tube video about how this person used their Leaf to power a few things using the 12volt battery via an inverter. Idea is the car with close to full traction battery can constantly charge the 12 volt battery that then feeds a directly connected 12 volt inverter to power AC items in ones house with a combined KW capacity under 1KW (1,000 watts). I think this is brilliant but am unsure on the capacity of the 12 volt battery in the Soul and if a 1KW inverter, or larger could be used? I would also think a more expensive full sine wave inverter should be used and not the cheaper ones that have electrical fluctuation that can damage certain electronics powered by that inverter. 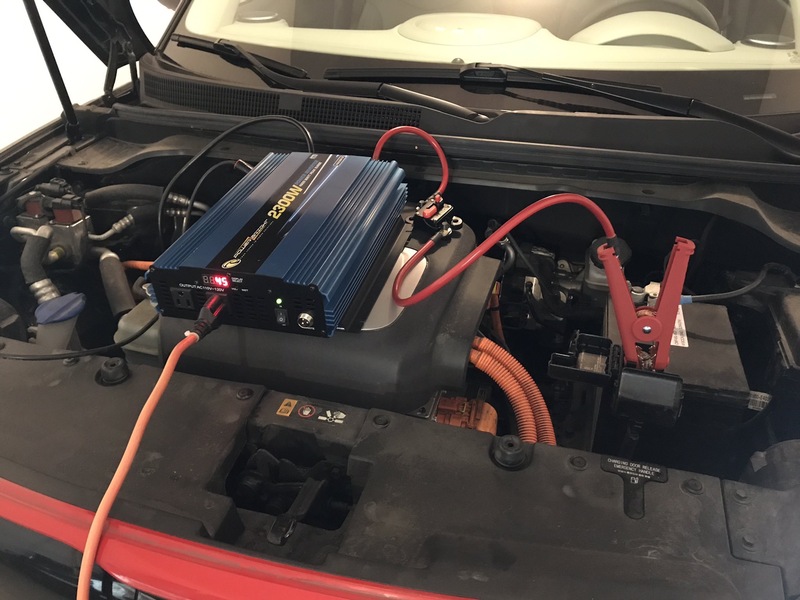 The capacity of the 12V battery doesn't matter, what matters is the power output of the DC/DC converter and the owner's manual says 1.7kW so running a 1kW inverter should be OK and still leave enough power for the rest of the vehicle. I've been thinking of doing this after we had a long power outage when the tornado hit the power substation here in Ottawa. Just enough to keep the fridge and hot water tank running, plus a few lights would be very good. Thanks for the feedback. I am thinking about the same thing. The fridge and some lights. here is a device that Mitsubishi has available in Japan and will take years to make available in North America. "In Japan, it’s sold retail and can be used with the Mitsubishi Motors i-MiEV, Nissan Leaf, Kia Soul EV, and the Toyota Mirai fuel-cell car." That's because our car, and the others come with CHAdeMO. That's going to be a lot better because there is only 1 conversion - high voltage battery to grid power, rather than going through that awkward 12V step in the middle. It would also allow a lot more power theoretically up to 70k. Some motors need a lot to get going and may struggle to start on a 1kW inverter. Setec Power has a 3kW CHAdeMO inverter. Looks like it is available on Alibaba for around $3k US. I saw some posts on Nissan Leaf forums that said it works, not sure if it would work with the Soul, it depends on exactly which version of the CHAdeMO spec the Soul implements. thanks notfred. I dont think these units output in US AC. Regarding your point about the awkward 12v conversion. I feel the same way. It has to not be good to continually pull power out of the Soul 12v battery that gets "recharged" from the traction battery for any period of time. One would think that battery isnt designed to pull that many amps in and out of it continuously. cgrieco16 wrote: It has to not be good to continually pull power out of the Soul 12v battery that gets "recharged" from the traction battery for any period of time. One would think that battery isnt designed to pull that many amps in and out of it continuously. It doesn't discharge - charge - discharge - charge-etc the 12V battery. The DC-DC converter keeps the 12V battery charged no different than running lights, climate 12V systems, seat heaters/coolers, etc. while driving down the road. For all practical purposes, if the car is turned on first, the 12V battery will experience no change in state of charge provided that the energy being drawn is less than what the DC-DC is capable of providing. Think of it like this, the inverter is hooked up to the battery terminals with clamps. The energy from the DC-DC converter goes up the cables to the battery but then gets "sucked up" by the inverter, bypassing the battery completely. I have 1000W grid tie inverter and I connect it to battery terminal, to combine electricity from grid and from my EV. It works well. However it doesn't work if electricity from grid is out. In that case you should use off-grid inverter. FYI, do prevent 12V battery discharge, the car should be stay in turned on. Note that mine is Niro EV, and I have utility mode that prevent car moving accidentally. I saw the same video last fall and pulled together a similar setup. The Soul EV and Leaf internal DC-DC converters for the 12V battery are limited to 1.7kW continuous, but I got a much larger size to handle the one time surge current for our fridge. I will never run it over 1300-1500W to keep the car’s DC-DC converter from getting taxed. Based on the Nissan Leaf forum information I saw on a similar setup, it may also be a key point to ground the negative terminal of the inverter and the inverter ground to the vehicle’s chassis.